This is Hershel. Hershel is our newest family member. We're going to pick him up on Josh's birthday, December 19th. We got to visit him two weeks ago and we fell in love with him. Since then we have been preparing for his arrival! Last night we got most of his supplies and are anxiously awaiting his arrival. I've been obsessing over "Bringing home puppy" videos and articles on how to raise a puppy. I have two dachshunds at home and I've had them since I was about 14. We didn't really train them or read any manual or anything. Everything these videos we're watching say we should do we just haven't with Miles and Nena. So I think I take that as a safety blanket. If we don't do exactly what we're supposed to do, Hershel will be just fine because my puppies are perfect. They're living happily and we give them absolutely everything! Josh and I have been wanting a puppy or kitten since I was living on my own in New Brunswick two years ago! We weren't planning on getting a puppy so soon after moving in but I got a bit ahead of myself and started the search pretty early. This is a bit of an update on life! We've been looking at venues and working on securing the date for the wedding. When we're not doing this we try to be with family or hosting dinners for them. We've been at the apartment for officially a month! It's been many things we knew it would be. We're very busy with work and with wedding stuff, so we really love the down time of being able to sit on the sofa and play video games or watching our favorite shows. It's been busy and sometimes lonely, but I know with Hershel we will be entering a new time for us! There have been a lot of new moments for us as a couple and they've all kind of came at us so quickly, but I think we're handing it all very well. My favorite thing to do is sleep in with him and talk about the days ahead or just silly things. I love seeing him come home from work and setting dinner up for us at night after a long day. If you would like to keep up with all that's going on I've been trying to post more on Instagram and Twitter. Since the move it's been a little slower on there than usual but now that there's a semblance of a routine forming I think it will pick up again. It's been a beautiful time for us, and with Hershel coming I know everything will only continue being magical. Fourth Year Anniversary - I'm Engaged!!! READING - Oh boy, reading. I have so many books I've purchased and gotten obsessed with but just haven't finished! I'll focus on the two books I've been completely obsessed with and have traded off in reading. Not That Kind of Girl by Lena Dunham is a book of essays about her growing up and the things she experienced and I just can't get enough. This isn't the kind of book I'm used to reading. I read Chick Lit and stories about bloggers and independent women falling in love... as well as biographies. Oh, the mix! Her writing is what truly keeps me going with this book. I love her humor and it makes me almost cringe at how much I want to reach out and grab her through the pages and just scream STOP PLEASE DON'T DO THIS. The other book I've been reading came out this week! Make Up by Michelle Phan has been a highly anticipated book for me. I won't go into too much detail here because I did want to focus more on this in its own post! But yes, I'm also reading this right now. FEELING - Things haven't been the greatest and I've been feeling it. You know when you've had a really, really bad day? And all you want to do is go to bed and just forget about everything? Well, I've been having a very bad week, each day containing it's little evil. I got my wisdom teeth taken out on Monday and I've been taking medication and feeling in constant pain. So I haven't been feeling too hot. It's Friday and I still feel like poop. THINKING - Though things are tough right now, I'm trying to make things better for myself again. I think about how lucky I am to have the things I have but also try to fully grasp what that all means. I think people think about this stuff a lot, and it seems to lose meaning. I've been trying to keep myself grounded on how grateful I should be with everything I do have and not focus on things I don't. PHOTOGRAPHING - I actually haven't been taking many pictures, lately! I usually am pretty good at documenting my day through photos on my phone but these past couple of weeks I've been coming up empty XD The most action my camera got this week was on Tuesday when I went to dinner with my best friend from high school and her daughter (and my goddaughter!) Perfect people to take pictures of, honestly. WRITING - Well I have been trying to write more on my blog! I can positively say that blogging is one of my passions so I've been trying to organize things in a way that I can actually write more on here! I would like to write more frequently, but I think I've been doing pretty good so far. 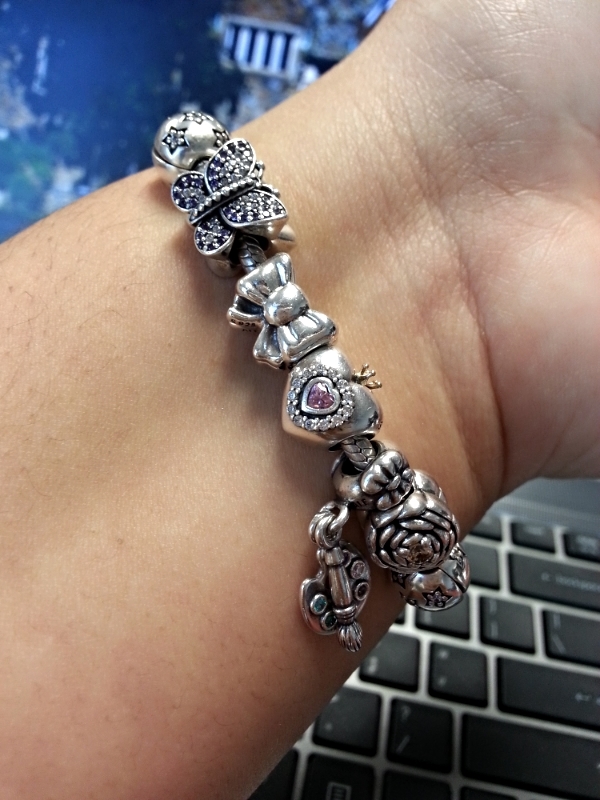 USING - I've been obsessively wearing my Pandora bracelet Josh got me and I love just looking at it sparkle! Also, rain boots, because it's been disgusting here. LEARNING - Learning, hmm? I guess this week I've learned that it's ok to not be ok. And actually mean it. And also that there will always be the pull to your push that you feel. For every negative thing there will be positive things. Nothing sucky lasts forever. Some final thoughts on this post! Tomorrow Josh and I are celebrating our 4 year anniversary! We're going to a restaurant in Philly, following our tradition of celebrating in a new city each year (so far). This will be our first anniversary where we get all dressed up and actually celebrate at dinner instead of making it a whole day long thing. We don't live together and we work all week so it's difficult to find a time not to latch onto one another when we can, and when we do, we tend to not let go <3 I have everything set up and ready for Saturday, I just need to get all dolled up for then (hair, nails, outfit, etc.) so that's what today is about. I hope everyone has a wonderful weekend! Hello everyone! I've been meaning to write up an art related post and I wanted to start with the supplies I use when I reach for my bag. I find it easier to keep everything together this way. I don't usually carry my art supplies and sketchbook around with me, only when I know I'll be using them like on an art date or any time I set aside for it. First of all, my sketchbook is huge. I'm a big fan of this kind of sketchbook because of the paper quality and because of the size. I don't think the paper quality is THE BEST, but it's the best for sketching and trying out colored sketches. I'm always hesitant to use the Moleskine extra large sketchbook Josh got me for Christmas two years ago because I feel like that paper quality truly is amazing. I'm always thinking "I better draw something REAL GOOD IN HERE" and end up getting too stressed to get anything down. I really love the Moleskine basic notebook in extra large because I also think the paper quality in it is superb for sketching, but I don't think it's the best for colored sketches. The colors bleed through ;-; But not in this sketchbook! I've always preferred bigger sketchbooks to medium or small sketchbooks. So this one is pretty big and doesn't fit in any of my purses, I really need a tote for it. I use four erasers, three of which I keep inside my organizer. I have the basic medium one from Staedtler that I've used for years, my smaller one that I upgraded to from a black one the same size that I used for years as well, and a much tinier one! I got the tiniest one is from a brand called Mono, I found it in a Japanese book store. It was pretty expensive, especially because I was convinced I'd never find replacements for the erasers again so i stocked up on them, too. I thought at first it would be great to use for even tinier mistakes in sketches, but it turns out it's even better for detailing hair and eyes in my sketches. It's a great addition to my collection! The pink one, which is the next smaller one, is great for mistakes that are tinier than the ones that can be fixed by my larger eraser stick. I've used this since I was in college and found it hiding in the art supply store for our art school. They only had one and I snatched it up right away, convinced I'd never find anything like it again (sound familiar?)! Well, the other week while exploring a new Japanese art supply store with Josh, I found a bunch! They were the first I found in stock anywhere besides that tiny store at my University that I never found again. I got two and a bunch of refills so I should be set for a while! These are the rest of my supplies in my organizer. It's not very big, and i don't want it to get bulky, so I only keep my essentials in there. I have my eraser sticks, my mechanical .03 pencil in pink, my 0.5 pen in pink, a Copic marker in Light Prawn (I shade my sketches with this color!) a bold black marker from Staedtler for inking purposes and my 4 number 2 pencils from Staedtler. My Radiant Orchid case is actually from Spehora. On a vacation with Josh back in April to Washington D.C. we got a chance to visit a mall in the area and the Sephora there was giving this out for free! Yes, it's supposed to be a makeup case but I loved the design too much to use it as one. Like most of my cases that are supposed to be makeup cases, it turned into my art supply bag. Inside I keep my set of inking pens, some pastel colored Sharpie pens that I use to ink, a pen from Muji that doubles as a 0.5 pencil and a 0.5 pen (perfect for sketching and inking, wow, I need like ten of these. ), my big chunky eraser for big erasings and my sharpener that I didn't realize is almost completely out of frame. I used to think having two art supply pouches was a lot but I find that I like the setup a lot. I use everything I pack and feel like I don't need anything I don't have at my disposal. I hope you enjoy reading this as much as I enjoyed writing it! Leave me a comment telling me what you carry around in your bag!